Welcome to the neighborhood. Meaning south Bushwick. That’s where Greenpoint entrepreneurs Kimmee and Evan Hoffman went to find expansion space for Brooklyn Spice Company. They signed a 10-year lease for a 5,060-square-foot, single-story building at 294 Cooper St.
“The price is right. The landlord’s wonderful. We love the nearby businesses. And it’s still Brooklyn,” Kimmee Hoffman told Eye on Real Estate in a recent interview. The asking rent for the Cooper Street warehouse was $17 per square foot, said Jacques Wadler, an associate broker at Kalmon Dolgin Affiliates. The Hoffmans, who launched their business in 2011, will continue to use their current Greenpoint location, which is a 2,500-square-foot warehouse at 225 Eagle St. The married couple’s business is a wholesaler of spices, flavors, seasonings and rubs. And under the brand name Greenpoint Trading Company, it sells to consumers online and at stores in New York and several other states. And it sells its products to subscription-box companies such as Hamptons Lane and the Hatchery, which send packages of artisanal foods and ingredients to customers every month. Brooklyn Spice Company really needed more room. “We were at a critical point in the spring. It was taking too long to do our custom-blend spices because we only have room for one mixing machine here,” Kimmee Hoffman said at the company’s Greenpoint warehouse, where sacks of spices are stacked nearly to the ceiling. At the south Bushwick facility, “we can double our production rate and take on more business,” she said. The newly rented Cooper Street warehouse will be used as a production facility for blending, packing and shipping spices. The wholesale business will be handled there. Evan Hoffman hopes it will be ready to move into as early as mid-August. “We’re half-way done with construction,” he said. The warehouse already had an office and bathrooms, which cuts down on the work that needs to be done. Two spice-mixing machines will be placed in separate rooms, with one room solely for making products that do not contain the top eight food allergens. A third room will be dedicated to packing. According to city Finance Department records, 294 Cooper St. belongs to Celtibero LLC, which bought the property for $749,000 in 2008. The LLC’s sole and managing member is Miguel Friere. 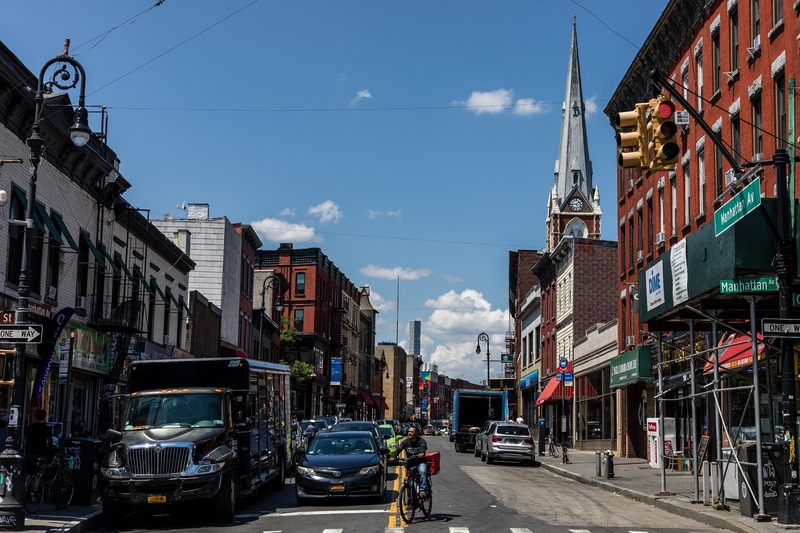 The Hoffmans, who live in Greenpoint, will continue to use their Eagle Street warehouse to fill Greenpoint Trading Company orders. They won’t start working on this new endeavor until January because the holidays are a busy time for their business. Also, they’ll be attending the Winter Fancy Food Show in San Francisco in January. For the first time, their spices will be displayed in the Brooklyn Chamber of Commerce’s exhibition space at the show. According to Finance Department records, the longtime owner of the Greenpoint building is 225 Eagle Corp. The day we visited the Hoffmans in Greenpoint, their warehouse smelled deliciously of Italian sausage seasoning, which has fennel in it. The shelves were stocked with more than 200 different ingredients. Foodies will appreciate this: Greenpoint Trading Company’s product lineup includes a product called Coffee Rub. It’s made of dark-roast coffee beans that are ground to the Hoffmans’ specifications by Brooklyn coffee roasters plus dark chili powder, paprika and other spices. Customers use it on a variety of foods, from brisket to baked salmon to avocado toast. Also, there’s Roasted Garlic Pepper Seasoning — which contains both garlic and garlic extract. South Bushwick, where Brooklyn Spice Company’s newly rented warehouse is located, is an intriguing area on the border of Ridgewood, Queens. Warehouses and rowhouses are intermingled on low-rise blocks, which are situated near a pair of cemeteries. Before signing their south Bushwick lease, the Hoffmans looked in Greenpoint for expansion space. But the rents for warehouses were $25 per square foot. There was a great warehouse in Maspeth, Queens, just 10 minutes away from their current location. But it was expensive. The south Bushwick building they rented was on the market for only three weeks, said their real estate broker, Wadler. He and Vincent Lopez, a Kalmon Dolgin licensed salesperson, represented both Brooklyn Spice Company and the landlord in the lease deal. “Right now, warehouse space is in high demand throughout all of Brooklyn,” Wadler told us.